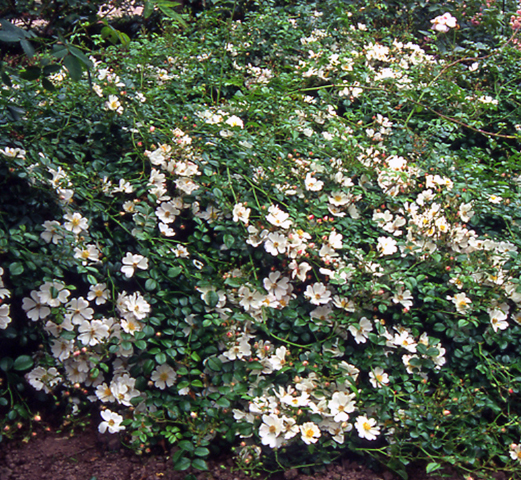 Ground cover roses are usually low growing shrub roses with a spreading habit, or rambling roses that have been allowed to spread horizonatally over the soil rather than growing vertically. Both types should be deadheaded after flowering, and usually only need sufficient pruning to keep the plant within its allotted space. Typical formation of a Groundcover variety. Pruning is best done in late winter, or early spring as the new growth begins to appear. *With established plants leave some dormant buds in reserve for any that might get damaged by late frost. Remove dead, diseased, damaged, weak spindly shoots, then if required, hard prune wayward growths to within their allotted space. Reduce main shoots by about one third, and sideshoots back to two or three buds. Prune the main branches down to approximately 100mm (4") or two or three buds from the main stem / base. Shorten the sideshoots after flowering to keep within their alloted space. If they have become too large and congested prune the main branches down to approximately 100mm (4") or two or three buds from the main stem / base.